Honolulu, February 13, 1906, page 2. Two young men, strangers in Honolulu, had an experience in the surf off the Moana Hotel yesterday about noon which they will hardly wish to repeat. They were in a perilous state of exhaustion while clinging to a surfboard when a canoe manned by Chief Clerk Jeffrey of the Moana Hotel and Mr. Harvey of the hotel buffet reached them. They were taken aboard and conveyed to the shore. Mr. H. S. Wood of St. Paul, Minn., and a young companion named Ryan of Chicago, went surfing about 11:30. They took a heavy board with them. After reaching a point about opposite the end of the Moana pier, Mr. Wood started off by himself. There was a heavy outsweep of the surf at that time, and Mr. Wood was being carried out to the deep places faster than he thought. When about a hundred yards away from the end of the pier, where the water is about twelve to fifteen feet deep, Mr. Wood found he was becoming exhausted. He called for help and Mr. Ryan who still had the board shoved it along and paddled to Mr. Wood's assistance. Neither are good swimmers and Ryan had to depend upon the board for his own buoyancy. Mr. Wood the latter caught hold of the board and lay on his stomach on the larger end. Meanwhile an elderly gentleman raised the alarm and ran shouting to the shore to have a boat manned. Several ladies called to the only other male bather, and he swam from near the shore to the aid of the men. Grasping the end of the board with one hand and swimming with the other he prevented the board being carried further out to sea. A large outrigger canoe was manned by the two men named and bringing it alongside the two luckless bathers were drawn in. and the third who had gone to their assistance swam back to shore. The incident caused no end of excitement and the .pier-end was crowded with people who watched the rescue. New York, February 18, 1906, page 17. RIDING THE SURF AT HAWAII. The Sandwich Islanders are exceedingly skillful in this form of sport. The canoe is lying idle on the water, the paddlers resting and the stern turned toward the incoming breaker. These waves are of prodigious size. The canoe will soon be caught up by the breaker and be borne on its crest far up on the strand. The skill of the steersman will be shown in keeping his frail but heavily loaded craft nicely balanced on the crest of the wave. A slight deviation right or left would expose the broadside of the canoe to the breaker, and the party would be upset in the twinkling of an eye. For aquatic sports Hawaii has been peculiarly favored. The steady trade winds enable sailing craft to make fast and certain voyages,which are never hindered by dangerous fogs or storms. For twenty years Honolulu has had an annual regatta. Swimming and diving contests and Japanese sampan races are features of the regattas. Surf riding in native canoes and upon surf boards in ancient Hawaiian style is practised all the year round at Waikiki, the great swimming beach of Honolulu. The canoes are manned by expert natives, and the sport is most exhilarating to the passenger. Bathers navigate the surf boards for themselves. To ride to shore from the edge of the reef several hundnd yards out upon the curling summit of a great comber is a thrilling experience. Honolulu, June 5, 1906, page 8. MR. BONINE OF THE EDISON MOVING PICTURE COMPANY WILL LEAVE SOON FOR KOHALA. Mr. Bonine, the representative of the Edison Moving Picture Company who is taking views of various scenes in and around Honolulu will leave soon for Kohala to take views of the opening of the Kohala ditch and of the ceremonies that will be carried on at that time during the celebration. After Mr. Bonine finishes taking pictures at Kohala ho will visit the volcano and will take several views of it. Moving pictures of tourists descending to the floor of the crater will be obtained. Where it is not possible for Mr. Bonine to obtain moving pictures he will take photographs for lantern slides. He will get pictures of the fern forests in this manner. Mr. Bonine intends to visit Maui before returning here. He will photograph the best scenes on that island. The steamship company, recognizing the value of the work in which Mr. Bonine is engaged will do all in their power to make it pleasant for him. Views of the fishmarket and of the surf riding at Waikiki have been secured. It is thought that the picture of the fish market will be very fine as it was taken under the very best of conditions. Mr. Bonine seems to have an immense capacity for work and no doubt his visit will be of untold value to Hawaii. Secretary Wood of the Promotion Committee is doing all in his power to assist Mr. Bonine in his work. It was was the suggestion made by Mr. Wood to the Edison Company that brought Mr. Bonine to these islands. Mr. Bonine doese not know when he will return to the coast. Honolulu, June 8, 1906, page 5. Bishop Slip Abandoned For Lack of Room. The committee of the Water Carnival occurring on Monday evening next has changed the scene of the event from the Bishop slip to the Naval wharf. This has been done on account of the crowded condition of the former wharf. Persons who have reserved seats are requested to pay for same before tomorrow by 5 p. m., otherwise the reservation will be canceled. The only Rycroft, the man with the big versatility, will play a special part in the Water Carnival. Entries are coming in fast and furious, especially for the obstacle race which promises to provide any amount of fun. A feature of the carnival will be the swimming of a lad named Lawrence Cunha, a recent arrival from San Francisco. He has been practicing with the boys at the Healani boat-house and has developed surprising speed which goes with a very pretty stroke. In practice races he has made the Healani swimming cracks hustle. James Girvin, who did great work at last year's carnival, will be seen again this year. Messers. Tinker, Oss, Kerr and many other good swimmers are practicing hard every night and may. be expected to cut a prominent figure in the races. George Freeth, the most graceful swimmer in the Islands, is not only preparing himself for several events he entered, but is coaching the swimming squad of the Healani Boat Club. Honolulu, June 16, 1906, page 6.
open to the public on Saturday, June 30th, when a ball will be given on the beautiful lanai that has been built for that purpose. The old kitchen and old bar building, more familiarly known as the "chicken coop," are things of the past and a modern kitchen, dining room and buffet will offer the Honolulu and traveling public the best that can be had. One very important feature is the small farm addition, as the table will be supplied with poultry, eggs, squabs, frogs, mullet, vegetables, etc., from the premises. This will give the Seaside an advantage over less fortunate competitors. Light Canadian paddling canoes, Hawaiian canoes or surf-boards can be rented at a nominal figure. On Wednesday evening next the grounds will be lighted up for. the first time in their remodeled condition, the Governor giving an elaborate dinner on that day. The Seaside will fill a long felt want and with the Moana will be able to satisfy any traveler that may wish to sojourn on our shores. It will be good news to automobilists that the large building formerly used as a stable, will be used as an auto-shelter. Thus, in case of a shower, the machines will be under cover. A boarding-stable, with large grass paddock adjoining, is another feature that will appeal to those living in the neighborhood who are owners of horseflesh. Honolulu, July 11, 1906, page 6. George Freeth is impatiently awaiting the time when he can don the old Maile suit and call out 4-11-44 and play the game of the giants. George Freeth is due for some high diving next Sunday at the Healani Boat House. He is also going into training for some of the swims. Honolulu, August 1, 1906, page 1. WILL TAKE A DRILL OF COMPANY F AND TACKLE SURF RIDING. Surf-riding is another thing Bonine wants to get, and Atkinson, who is an expert at the business, is arranging to assist him. The swift sight of a surf boat on tho crest of a good wave is regarded as one of the most important of local scenes and at me same time very hard to get, as it can only be seen at best from some distance out in the water. Bonlne will probably plant his machine somewhere in the water and try to get a view in a passing boat. Honolulu, August 6, 1906, page 7. From the edge of the bluff there burst into view one of the most picturesque and typically Hawaiian scenes to be found anywhere in the islands. There was a deep, wide gulch. A river flows down to the sea which here forms a natural bay and a fine sandy beach. In the center of the group of the tallest cocoanut trees is the home of the McBrydes, a quaint old-time structure whose painted roof suggested the odd design of Somoan tapa. Over the entrance to the lanai was "Aloha", wrought in bamboo sections fastened to a weather and sea worn surfboard. Lacings of palm-branches enclosed the lanai and just within could be seen tables arranged for a luau. Honolulu, August 11, 1906, page 2. Moving Picture Ready for Gotham in October. Captain Sam Johnson's crack Company F., National Guard of Hawaii, will be seen in New York city in about eight weeks, and pleasure seeking Gotham, at least, will have an opportunity of judging whether or not the company is a crackerjack. New Yorkers will see Company F. projected upon a screen by a moving picture machine, the film having been taken yesterday afternoon on the grounds before the drill-shed by Robert Bonine, Edison's moving-picture expert. The company showed itself to the best advantage in its silent bayonet drill in which it has become expert. Tomorrow afternoon at 3 o'clock Mr. Bonine plans to get a canoeing and surfboard scene off-Waikiki beach in front of the Moana and Seaside hotels. Then a view of the crowd on shore will be taken. Mr. Bonine hopes that every canoe at Waikiki will be out. He wishes to have them start in all at the same time, and when they are in motion toward him he will take a film. Those who can ride surf -boards standing will also be looked for bv Mr. Bonine. The expert 's concluding picture will be of the crowds returning to town from the baseball game on the Rapid Transit cars and Manager Ballentyne will personally arrange his cars that Bonine will get the best results. Honolulu, August 11, 1906, page 8. Sunday afternoon, between' the hours of two and five, Mr. Bonine, the expert, will take a series of moving pictures of surfboat and surfboard riding at the Moana Hotel and vicinity. A life-like exhibition of this Hawaiian sport will be a great feature on the mainland and will tend more than anything else to induce people to come to our shores. All owners of canoes and small craft as well as bathers should be on hand to make a good showing for Hawaii. Honolulu, August 12, 1906, Sunday Advertiser, page 1. Moving pictures of canoes and surfboard riding are to be taken off the Moana and Seaside hotels, Waikiki, this afternoon, by Robert Bonine, the Edison expert. This will take place about 3 o'clock and he hopes that every canoe and every surfboard along the beach will be out and fully manned. Those who can ride surfboards standing up are wanted to be there in force. Such a picture should be one of the most popular in eastern theaters and the more boats in the scene the merrier. This will be the very last picture taken by Mr. Bonine and finishes up his last film. Honolulu, August 13, 1906, page 1. Everybody that could get in focus was "Bonined" at Waikiki beach yesterday afternoon. That is, they were included in some rare pictures taken by Robert Bonine, the moving-picture man of the Edison company of Orange, N. J.
Suffice it to say that the Moana and Seaside beaches had one of the biggest crowds in their history. The crowd spread all over the lawn at the Seaside and covered the lanai and piers of the Moana. Then the water was fairly alive with people, and all were in a merry mood and that, of course, was best for the moving picture. Hawaiian canoes, birch canoes, surf-boards and water wings were greatly, in evidence. There were big rollers yesterday and it is believed that some good pictures were taken of surf riders standing erect on their boards as they were shot on the crest of waves toward the shore. These were taken from the end of the Moana pier. Then another picture was taken from the beach, halfway between the Moana and Seaside. This was a circular picture, and included the hotel buildings, grounds and the entire beach. Some of the bathers were doing acrobatic stunts and these should show up well when reproduced. Mr. Bonine was satisfied and so was the crowd. Honolulu, August 17, 1906, page 5. By Lady Lawson in Black and White. In no part of the world does the traveler receive a warmer welcome than in peaceful, ocean-girt Honolulu, the capital of the Hawaiian Islands, where he is greeted with a genuine aloha (the universal word of salutation), treated with generous hospitality during his stay, and begarlanded on departure, according to the pretty Hawaiian custom, with charming wreaths of strung flowers, called in the vernacular "leis." Moonlight bathing parties are most popular at Waikiki Beach, the fashionable suburb of Honolulu, and no where is ocean bathing more perfectly enjoyed all the year round than inside the coral reef there, additional excitement being lent to the ordinary "dip" by riding on surf-boards. The skilled Hawaiian takes his surf-board out to the place where the reef breaks the swells into rollers, and. catching the impetus of the topmost one, he rides on its crest, stretched at full length, or even standing erect upon it. Ordinary visitors pay five dollars for a surf-canoe, and find it sufficiently exhilarating to ride out to the roaring surf, where the oncoming wave lifts the stern of the canoe, and sends it spinning shoreward in a cloud of driving mist, while the surf roars beneath. Honolulu, September 5, 1906, page 5. SURF REPORTED HIGHER TODAY AT WAIKIKI THAN IT HAS BEEN FOR MONTHS. The surf at Waikiki is reported today to be the highest seen at that place for a number of months past. Huge breakers are rolling in and piling up on the beach in a fashion that is seldom seen on this side of the island. Many natives and others went out to the beach this morning to take advantage of the high rollers and had enough exciting sport of surf riding. Late last evening the surf was high off the harbor and the Healani crew on its evening pull went outside of the buoys and came very near being swamped in the high waves. Constant balling of the boat was required on the pull back. The boat was at times over half full of water. Many are expressing fears for the transport Sheridan, ashore at Barber's Point. The surf there must be high also and that is bound to work considerable hardship on the stranded vessel. There is no apparent cause for the high surf as the weather conditions seem to be about the same as they have been for the past two weeks. Some attribute the cause to the unusual disturbances at Hilo noticed during the past two days. Honolulu, September 12, 1906, page 6. BOAT CREWS GETTING INTO GOOD SHAPE FOR THE RACES ON SATURDAY NEXT. Everything Is In readiness for the coming events on Regatta Day. There seems to be but little doubt that the coming celebration will be one of the finest seen In Honolulu for a number of years. The celebration will start at :30 a. m. on Saturday next and will be the eleventh celebration hold In Honolulu of the day. The program committee have arranged a number of races for the celebration. These will consist of boat races of all classes and will be for the most part between the Henlani and Myrtle boat clubs. One crew is to be entered from Kona, but that Is probably the only crew that will come from any of the other Islands. They will be brought here by Prince Cupid to compete with the Brown crew In the canoe race. It Is said that the crew from Kona will make the local crew work hard for the race. Senior Barge Crew- P. J. Jarrett, stroke; George Freeth, 5; Robert McCorrlston, 4; .Henry O'Sullivan. 3: M. Robinson, 2; Vincent Fernandez, bow. Harry Steiner will be coxswain for this as well as for the Freshman barge crew. Senior Pair-Oared- Henry O'Sullivan, George Freeth. Honolulu, October 2, 1906, page 9. Many witnessed George Freeth performing in the surf, at the Moana, on Sunday. Honolulu, October 11, 1906, page 6. GEORGE FREETH HAS DUG UP TWO TEAMS TO PLAY THANKS GIVING DAY. And the thud of the football will be heard after all in the big League. Through the efforts of George Freeth one of Honolulu's best Intercollegiate football players, there will probably be a big game of Intercollegiate style of football at the baseball park, Thanksgiving day. It will be between the Mailes and the Infantry. And what would be a Thanksgiving day without a football game? In the states for several years past such a thing has not been heard of. It is as important to tho proper observance of the day as Turkey and cranberries. Without a football game to go to, Thanksgiving Day would be like the Fourth of July without firecrackers. Now George Freeth pondered deep and well over the situation. He plays football just as he goes in for water sports, for the sheer love of the game. It Is his specialty among many other specialties. Finally he bethought himself of the Infantry. Then away to Camp McKinley he fared and soon got the promise of a game provided that a coach would be provided them. It was up to George to find a coach and he did. Honolulu, October 12, 1906, page 6. There is said to be some prospect of an intercollegiate football game on Thanksgiving Day. George Freeth is trying to arrange a game for the holiday between the Mailes and the Infantry. The chances of such a game are regarded as slim, however. "Socker" is now being played by many of the old intercollegiate players, who do not relish the idea of mastering the new rules for only one game. Honolulu, October 27, 1906, page 6. BEST SWIMMERS IN THE ISLANDS BAND THEMSELVES INTO CLUB WHICH WILL BE EXCLUSIVE. The new swimming club was organized last evening at the Young Hotel. A committee consisting of George Cooke, Jess Woods and A. W. Kopke were appointed to act as committee on by-laws. The club will probably be known as tho Hawaiian Swimming Club. The charter members of the club are W. A. Dickson, W. P. Roth, W. T. Lyle, W. H. C. Campbell, Jess Woods, A. S. Robertson, Percy Foss, T. T. Hustace, W. M. Cooper, Harry H. Tomlins, A. W. Kopke, L. Cunha, G. A. Crozler, George Freeth, Peter Baron, Carl Oss, Jess Woods and George Cooke. Honolulu, November 1, 1906, page 6. THE HAWAIIAN SWIMMING CLUB HELD MEETING LAST NIGHT AND ELECTED OFFICERS. The Hawaiian Swimming Club was formally organized last evening at the Young Hotel, this being the second meeting of the lads who swim. Last evening the by-laws were adopted and the officers elected for the coming year. They are, Jess Woods, president; Willie Roth, vice-president; Harry H.Tomllns, secretary; Will Dixon, treasurer; George Frecth, captain; George P. Cooko and A. Robertson, directors. The first appearance of tne club will be made upon the eveing that the Hotel Baths open. The boys will turn out at that time and will give a short program before the invited guests upon that occasion. Then within a month or two the club will hold a meet to decide championships and the like. George Freeth was chosen as captain of the club and ho will no doubt make a splendid officer. His ability as a diver and swimmer Is known afar throughout the Islands. Honolulu, November 24, 1906, page 6. There will be- two good games of Association football at the baseball park this afternoon. At 2:30 the Infantry meet the Punahous. This is the first match of the Punahous and their strength is as yet an unknown quantity; the Infantry, however, are bound to give them a tussle from the time the whistle blows. Capt. Bob. Catton, who made such a strong forward last year, is down to play full back today. There is certain to be a battle royal in the second match between the Mailes (the champions), and the Diamond Heads. The latter were almost invincible at the end of last season and it is reported that this year's team is even stronger. The supporters of the Mailes, however, are very sanguine and think the prospects of their retaining the cup for another year are still good. Mailes: Goal, R. Chillingworth, backs, Anderson, McGill; half backs, F. Davis, Center, E. Kellett; forwards, George Freeth, Jamieson, Gray, Catterall, E.
Honolulu, November 29, 1906, page 7. Amusing Incident in Stage Canoe and Waves. Tableaux of ancient Hawaiian life were shown on the stage of the Hawaiian Opera House last evening, under the auspices of the Hawaii Ponoi Society. Included in the program was a list of Hawaiian songs. In one scene, showing the king in a war canoe crossing a channel, the king almost took a plunge into the canvas. The canoe had gone across once. The king in his long robes and helmet, and carrying his spear, stood upright in the craft. The curtain went down after the voyage across the stage. But the audience insisted on an encore and the canoe was sent back again to begin another voyage. The second trip was not so smooth. A kona or something was blowing, for the canoe went along by fits and starts and the king lost his balance, much to the delight of the gallery gods. The surf-riding tableau, showing Kelea. the surf rider of Maui, was an artistic effort. Mr. Kane, as Kelea, stood on a surf board thrust through a canvas billow. He rode the board standing on one foot. The whole effect was life-like. Honolulu, December 12, 1906, page 1. Yesterday afternoon the body of a man was discovered floating in the harbor near the Fort street wharf, which was afterward identified as that of James W. Girvin. The body was discovered and brought to shore by a waterfront policeman, Chas. 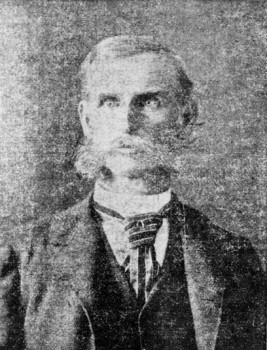 Mulleitner, and was immediately taken to the morgue. It was some time before the body was identified, the features being altered through the length of time the body had been in the water, but a search of the clothing resulted in the finding of a number of letters, the addresses upon which left no doubt as to the identity of the deceased. An inquest as to the cause of death has been ordered and will be held this afternoon, although the attending circumstances make it plain that a verdict of accidental drowning will be found. There is nothing at all to lead to any supposition of foul play, the money, watch and other jewelry of the deceased being found on the body. THE LATE JAMES W. GIRVIN. The deceased wag last seen alive on Saturday night about midnight, when he was observed walking along Alakea street in the direction of the water-front. Tere was nothing whatever unusual in his appearance or manner, and the supposition is that he in the darkness missed his way and plunged over one of the docks into the water. After the body had been identified it was removed from the morgue to the undertaking parlors of H. H. Williams. James W. Girvin was born in Canada about fifty-six years ago, being a son of a district magistrate of the crown. He came to the islands in 1860 and remained until 1RS6. during which time he was engaged in mercantile pursuits in Wailuku, Bahama and Hilo. For a time he was a manager at Bahaina for one of the stores of Archibald Cleghorn and filled the name position in Hilo for the same gentleman. He left with his family for Diego he hnvinEr married on July 16 1873, a Miss wnifong, sister of the present tax assessor of Hawaii County. In San Diego he was engaged in nusinfss during; the next few years. Mr Girvin returned to Honolulu, his family following in June.
. severa, years m aftgr annexatlon. In that place he became a staunch advocate of the rights of the Chinese and has always been considered by them a very good friend. On his retirement from public office he began business as a commercial agent having an office for himself. He did most of the business at the custom house, and much before the lower court, of the Chinese in Honolulu. His work in that department was recognized as superior, for he had always a penchant for statistics. He entered the employ of the Hawaiian Gazette Co. in June. 1905, as libraflan. a position he filled with entire satisfaction of his employers up to the time of his death. He has been a frequent contributor to the local and foreign newspapers and magazines and his articles have been widely read. His last effort was made on Saturday night, for publication in the Sunday Advertiser. It related to the John Cummins claim and was pointed and interesting to those who have followed that case during the past eleven years. He was appointed jury commissioner by Governor Carter about two years ago. the wife of W. H. Rice, Jr., on Kauai, and three, a young son and two daughters, with their mother at the residence on Kinau street. A married sister resides in California. Mr. Girvin did not leave the Gazette office until late Saturday afternoon, leaving shortly after drawing his pay. ner satttroay and his son Clarence came to the office to inquire after him. A few minutes later Mr. Girvin came in. but his son had left. He did not appear at his home Saturday night, and on Sunday Clarence again called. water nearly thre days and this leads to the belief that Mr. Girvin took the wrong car Saturday night. discovering his mistake, perhaps, when near the waterfront, and fell in owing to the poorly-lighted thoroughfare in that section of the town. The funeral will take place at 3:30 this afternoon from the undertaking rooms of H. H. Williams, Interment to be in Xuuanu cemetery. Honolulu, December 21, 1906, page 4. The regatta to be held at Waikiki on New Year's day is moving in the right direction of promotion work and well deserves the support of the community. "Such" an event can not fail to impress visitors with Hawaii's semi-tropic charm and this, in itself, is a thing eminently desirable. Tourists do not come here to enjoy the metropolitan in diversion or spectacle. This they can find done much better in the land from which they hail. The Riders' Festival and the Cowboys' Carnival, properly worked up and advertised on the mainland, are events which would not fail to draw many tourists this way. In the same category is the Waikiki Regatta; indeed there seems to be no reason why it should not become the chicfest of them all. Aquatics rank first in Hawaii 's list of sports. The amphibious native is a waterman unexcelled in the world. He is a fish in the water and a god in a canoe. The premier paddlers, swimmers and surf-board manipulators of this and the other islands, assembled together, could furnish an exhibition which would well repay a trip from the Coast to witness. The coming regatta will, of course, be more or less of an experiment. It is being arranged at short notice and the brunt of the work is being done by two or three enthusiasts. It is an event, however, which should develop with each succeeding celebration and which is sufficiently attractive to a yearly fixture. Hawaii's most valuable promotion assets are those with which nature has endowed her. The coming regatta at Waikiki will be staged midst the land's signal charms and in the canoe-racing and surf sports, the stranger in the land will, to a very considerable extent, see the ancient water pastimes of on ancient people represented as they used to be and amid surroundings of sea, sky, palm and promontory, unchanged in themselves, since Hawaii's olden days. Honolulu, December 22, 1906, page 6. THE HOTEL BATHS WILL OPEN WITH AN EXHIBITION BY THE HAWAIIAN 5WLM.M1NU CLUB. Those who are so 'fortunate as to receive nn Invitation to the opening of the Hotel Baths will not only be treated to the finest exhibition ot aquatic sports over seen in this country, but will have the pleasure of seeing opened the only Institution and the first one of its kind in Hawaii. .George Freeth will do marvelous feats from a flying trapeze and other members of the club will perform dazzling feats from dizzy heights. Freeth, Cunha and Hustace will sprint in short distance races. Kepko will show how it is done on the Olympic Club. Shooting the chutes will be a new one to the local people. Probably the principal attraction of the many at this institution is the beautiful bathing pool 75 x 45 feet and containing 158,000 gallons of crystal water from the artesian well of the Young Hotel. This pool will be a merry place for the amusement seeker as well as those who desire a refreshing dip or warm days and evenings. Next and perhaps equally as important In this bathing pavilion are the perfectly equipped Turkish baths.which are as good a tonic In a tropical country as can be found. Steam, hot air. shower baths, massage, cooling and sleeping rooms comprise this department. Here Is something that every man and woman who Is looking to their future welfare, should Indulge in. They will certainly be repaid for their trouble. The Waikiki regatta this year is going to be a winner. There are earmarks of success all over the arrangements and the spirit with which the different aquatic enthusiasts about town are going into the affair augurs well for the welfare of the program. There are many entries in the canoe races and the rivalry is strong. These races will start early in the afternoon and will be run off strictly on time. One of the most interesting races of the day will be between the Kunalu Girls' Club and the Hawaiian Girls. Both of these crews are new ones to the public and they will probably row a pretty race. The regatta committee, consisting of A. L. C. Atkinson, A. A. Wilder and Lesllie P. Scott will judge all races and their decisions will be final. Clerk of course C. P. Chllllngworth. Starters A. L. C. Atkinson, A. A. Wilder. 2. Ladies race (six-oared gig). 10. Four paddle modern canoes. 12. Hawaiian old-fashioned sailing canoes. Honolulu, December 29, 1906, page 7. Best Swimmers Are to Compete at Baths Tonight. The formal opening of the Hotel Baths will take place this evening. The opening will take the form of a ladies night and admission can be had by invitation only. The ladies especially are taking a great interest in this event, and the commodious pavilion is sure to be crowded with fair ones anxious to see the cream of Hawaii's very best swimmers and divers perform. Relay, 300 Yards- Teams are captained by Freeth and Kopke. Honolulu, December 30, 1906, Sunday Advertiser, page 4. I never brought a ship into the harbor but I have come in on a canoe, on a surfboard and by swimming and I never went ashore on the reef once. Honolulu, December 31, 1906, page 6. If the weather does not prevent the Waikiki Regatta promoted by A. L. C. Atkinson will be a great success tomorrow. Everything is in readiness and only the roughness of the waters at the beach will mar or stop the affair. Notice will be given tomorrow if the regatta be postponed. Archie Robertson (captain), Tom Hustace, George Freeth, Lawrence Cunha, Will Lyle, Geno Allen. Vincent Genovas, Atherton Gllman, Lane Webster, Curtis Hustace, Francis Dodge, Stenwood Dodge, Harry Steiner. Carrie Crowes, Maud O'Sullvan, Hilda Robertson, Sarah Williams. Bernice Dwight, Birdie Reist; coxswain, Ben Clark. Cora Edmonds, Constance Restarick, Ella Wight, Ronnie Catton, Agnes Lyle, Gwendolyn Blair: coxswain, Luther Hough. Mrs. Legros, Julia Bush, M. Williams, Mrs. Otto Berndt, Mabel Wond, Minuet Parker; coxswain Bill Williams. Harry Steiner's Imp. Vincent Genoves' Arrow. Aklna's Healani. Lane Webster's Lark. Lawrence Kerr's Little Willie. Henry Hustace's Mary L. Edillo Boyd's Unnamed. Harold Johnstone's Mabel. W. Hedeman's Sauncy. Kamehameha Aquatic Club's Killii. Dr. A. C. Wall's Hanakeoke. Arthur M. Brown's Alabama. Albert Afong's Lei Illma. Kamehameha Aquatic Club's Kanalaupunl, Halo Halela's Kakaiklu. John LH's Kalahikiola. Virtue Vlylla's Alabama. Diamond Head Athletic Club's Alabama. Dr. A. C. Wall's Hanakeoke. Kamehameha Aquatic Club's Keawemalle. Kona Crew's Hanamlklol. Albert Afong's Lei Illma. D. Plikol Okuu's Halekulanl. O. Lelaloha's Huelo Puaa. O. Lelaloha's Let Illma. A. M. Brown's Alabama. Kamehameha Aquatic Club's KlllllIII.. Dr C. A. Wall's Hanakeoke. R. B. Booth's Halekulanl. Kamehameha Aquatic Club's Kanalaupunl. Hale Kelela's Makalklu. John Lu's Kalahlklola. O. Lelaloha's Huelo Puaa. Kalanlkelkl's Lapulla. Kamehameha Aquatic Club's Hanamlklol. John Lu's Keaawamalle. D. Plikol Okuu's Halekulanl. Dr. A. C. Wall's Hanakeoke. Albert Afong's LeiIllma. A. M. Brown's Alabama. Isaac Ihlhl's Kloloa I. John LU's Kalahlklola. J. A. Aplo's Palakea I. Moses Punohu's Palakea II.' Hale Helela's Makalle. Kapalhl's Oama. Iallula's Mahlklnalao. Kamehameha Aquatic Club s Haehae-kamanu. S. Kipi's Nalaupuni. Love's Kuawapuhi. Joe Lukela's Two Brothers. Harry Steiner, Curtis Hustace, Dan Keawemahi, Duke Kahanamoku, William Dole, Keanu, Dudy Miller, Atherton Gilman, Lane Webster, James McCandless. O. Lelaloha's Lei Illma. Dudy Miller's Kanekauwea, Kamehameha Aquatic Club's K1IH1 111. 1. Swimming race; six relays. Course, from flogs opposite A. M. Brown's residence to Moana pier. Course, from Moana pier to stake and return. 3. Sailing race; twelve-foot "lark" class. Course, starting from, Moana pier, rounding flag off J. B. Castle's residence, thence to flag off Fred Macfarlane's residence, thence returning to and rounding flag off J. B. Castle's residence, returning to and finishing at Moana pier. First and second prizes, cups. 4. Slx-paddle canoe race for the championship of the Hawaiian Islands. Course, from Moana pier to flag off A. M. Brown's residence, and return. First prize, $60; second prize, $30. Course, from flags opposite A. M Brown's residence to Moana pier. 6. Slx-paddle canoe race for amateurs. December 29, 1906 :: Surfriding Boards and Canoes - Waikiki Regatta. Geoff Cater (2010-2013) : Newspapers : 1906.